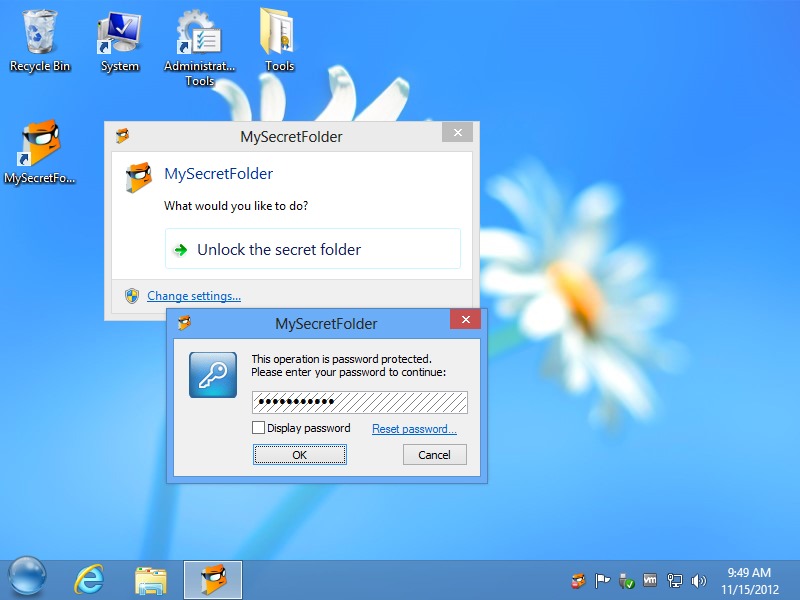 In addition of protecting a folder with a password, MySecretFolder also hides the secret folder from other users. How well will MySecretFolder hide the folder? MySecretFolder makes your secret folder invisible to Windows Explorer, other Windows or Office applications, as well as to the command-line tools. If other users attempt to find the folder, with Windows Explorer, or with the Search For Files command, or via the command prompt, or using virtually any other way offered by Windows, they will not be able to see the folder. For all practical purposes, your secret folder would no longer exist, and other users will have virtually no means of detecting its existence. Keep in mind, however, that if someone can physically remove the hard drive from your computer and attach it to another computer without MySecretFolder software installed on it, then the folder will NOT be hidden. If you need your secret folder to remain protected even in such a case, you need to use an encryption program instead, such as USBCrypt. How do I make the folder visible again? When you need your hidden folder to become visible again, run MySecretFolder utility (or double-click its taskbar notification icon), enter your password, and the hidden folder would come to light again, with all its files and subfolders intact and ready for use. When the secret folder is visible, you can work with the files and documents it contains just like with any other folder: open documents, save them back to the folder, drag and drop files in or out of the folder, and so on. When you are all done working with it, close its window and you will be asked to lock the folder back. Yes, it is that easy! No problem: Just click on the Reset password link on the password prompt window and enter your license information for MySecretFolder (you receive it when you purchase a license).